Talked to my Kawi Dealer Tech! I thought I would pass this on. I have a 2012 C14 and bought it with 1900 miles on it. As soon as I got it, I lowered the shift lever to fit my ride position better. I'm 6'8" so maybe a little different from someone 5'10"! Since day one I had problems shifting from 2nd to 3rd gear. Third always seemed like a problem. I noticed as I lowered the shift lever things would get worse and now 4th gear would hang up sometimes. I went to the Dealer where I bought the bike and talked to the Techs there and gleened a little surprising info. I was told that Kawasaki said that for the gear shifting to work correctly that the flats on the gear shift lever and the flat on the coupling that attaches to the shift rod have to match and be horizonal with each other! If you look at the coupling on the shift rod and the end of the shift rod they are prick punched and thats where they are suppose to stay! Soooo.. all that tells me is that there is really NO adjustment on this! I'm now looking at making a homemade shift lever where the up and down adjustment is in the shift lever it's self. Oh yea, I followed the Tech's advice and readjusted like he said and the problem with 3rd gear is gone? Re: Talked to my Kawi Dealer Tech! What you described in red is not very clear to me. When I bought my C14 the gearshift lever was way up at the same height as the top of the footpeg. After riding it a short distance, perhaps 20 miles, I lowered it to the level you see in the picture. From being the same height as the footpeg to its present level is a substantial distance. Either way, there was no difference in shifting between any of the gears. Since you're 6'8" and I'm 5'8", there is an even one foot of difference in our respective heights. My shoe size is 10 and Yours must be of a size that I can't begin to imagine. The C14 is a very big motorcycle to someone my size but must seem to you as a mini-bike would to me. If you can clear up the red sentence it might help me and perhaps others in understanding exactly what you mean. The picture of the Triumph does not seem to have any relevance to the topic. Did you possibly post the wrong picture or does it somehow lend significance to the topic? A photo of where you have the lever and another of where it is might also benefit anyone who may have some advice to offer. You are of the opinion that there is really no adjustment available is certainly not correct as I and others have adjusted the height of our shift levers by varying degrees with no loss of shifting ability. The shift LEVER yes, uses the punch marks. The shift PEDAL, adjust best for you. You don;t have to invent anything. Be careful talking to stealerships. The punch mark on the shift shaft and punch mark on the short lever that attaches to it should always align. But this in not where you make the adjustment. 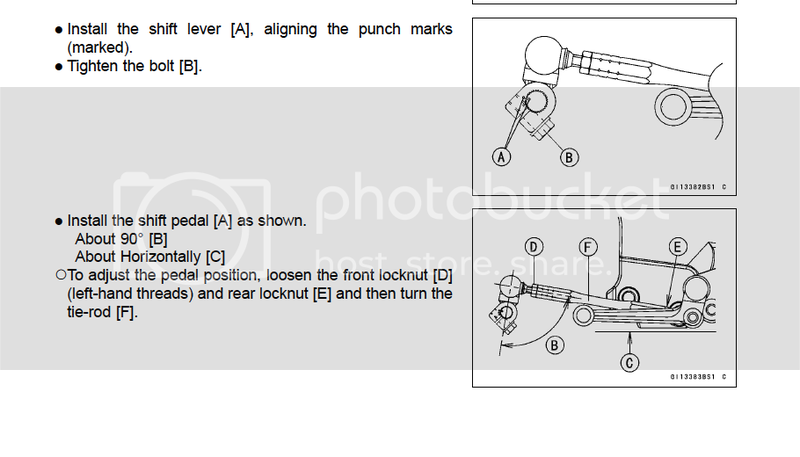 The tie-rod is where the shift lever height is adjusted. The lock nuts and and the hex adjuster are there for that purpose, adjust the tie-rod's length and you should be home free. Like you, I slid my coupler off the splines and moved it two splines from the original position so I could work it easily with my size 14's. I have had no issues with shifting whatsoever. Maybe you moved it further than I did? So you DID move the coupler instead of just using the "tie rod"????? So your prick punches aren't aligned any more???? 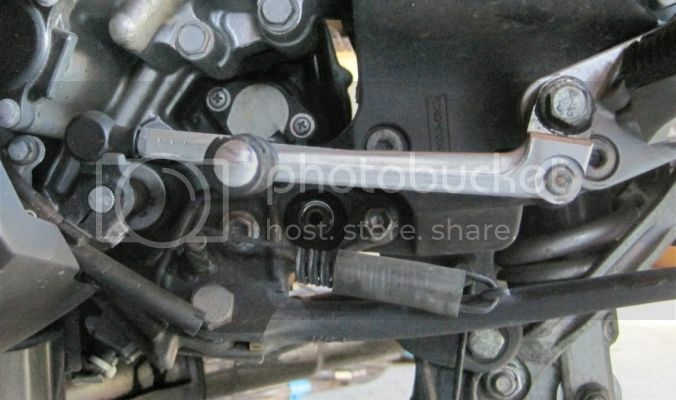 This is the only way I see for me to be able to run the shift lever further down, because when I do that with the tie rod only, my shifting of the gears go to crap!!! I havent tried moving the coupler yet,I think that is the problem/solution if youve got big feet maybe! I'm also going to some Cycle Pirate 360 pegs so this will have to be dealed with one way or the other! oh yea, I wear a size 15! Steve and Bud I thanked you on the other site but will do it again here. I hope to make the Wrench In at Steves in April! ........So your prick punches aren't aligned any more? I couldn't get enough range of movement without resetting the splines. My alignment marks are no longer aligned. I did notice before that if you go to far it will change the geometry enough to cause some irregularities in shifting though. I'll see if I can get a pic for you after the ride today. 37* right now, better bring my suntan lotion! OOOH, you're a funny guy! Thanks Matt,as I said when I tried just using the tie rod, I had really bad problems shifting and I think now the solution is to move the coupler! A pic would be nice to see how far you went if possible? Thanks! Well,I got the Cycle Pirate Pegs on and reset the gear shift and brake pedals. The gear shifter I changed the coupling position and then fine tuned with the tie rod adjust. Everything works goods so far going around the block but the real test will be later when I get on the highway and test at speed! The pegs were fairly easy to instal although I had to take a file and take of the sharp edges where they meet in the back corners of the peg mounts on the bike. I went back and down and the seating position feels better and I am more "in" the bike than before. Think I'm going to like them for now,time will tell! I went two splines from stock position. I took a pic but the marks are not clear anymore. Cool,as you can see from the pic ^^^^ I figured it out and have the shifter down pretty good! I think that is the key to getting the shifter that far down and have it work correctly (on MY bike) is adjust with the coupler. I will get out tomorrow and see how it does on the highway. Thanks for the help!!! Seagiant, how did you find the adjustment that Matt suggested? Often I find myself missing 3rd and 4th gear, drives me nuts! I tried adjusting the rod to keep the shifter pedal a bit lower, but it didn't improve much. Should I adjust the shift rod back to original position and move it from the shift rod coming out of the engine, like you and Matt did? Would be interested in your input. Quite tired of missing the gears! I had to re-position my shifter for the same reason. A combination of adjustment rod and positioning of the small arm on the shift shaft made things pretty effortless. FWIW, I wear a size 13 riding boot.